Jay Leno’s EcoJet is on display at the conference trade show in the New Holland booth. 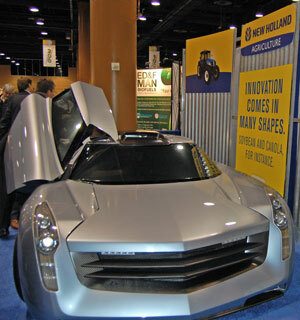 This futuristic car runs on 100% biodiesel and Jay had it custom designed by General Motors. It actually has a jet engine in it and has been on tour around the country. Steve says that the car is very light weight cranks out 650 horsepower and should be able to hit about 220 mph, although I’m not sure anyone has actually tested it at that rate of speed yet. At that rate it could give the Indy cars a run for their money! See more pictures on theFlicker Photo Album of from the 2008 National Biodiesel Conference by clicking here.